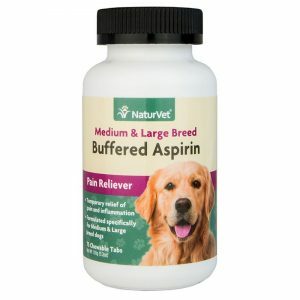 NaturVet® Buffered Aspirin Medium & Large Breed is marketed to provide temporary relief to dogs suffering from pain and inflammation. According to the manufacturer this product is only recommended for dogs, not cats and it should be administered with meals to avoid upsetting your dog’s stomach. This product is administered based on weight. Please follow the directions of use provided by the manufacturer. According to the manufacturer, NaturVet® Buffered Aspirin Medium & Large Breed is only intended for dogs over the age of 6 months. Dogs under 24 pounds need to use the NaturVet® Buffered Aspirin Small Breed formula. Acetylsalicyclic Acid (Aspirin) 300mg, Calcium Carbonate, Dicalcium Phosphate, Magnesium Stearate, Maltodextrin, Microcrystalline Cellulose, Natural Flavoring, Silica Aerogel, Stearic Acid. NaturVet® Buffered Aspirin Medium & Large Breed is not recommended for long term use. It is only intended to relieve pain and inflammation in dogs Not cats. You may purchase this product online or from local pet retail stores.